Nags Head, NC beaches are the ultimate playground for fun and sun-loving vacationers! You'll find miles of pristine shoreline, rolling dunes, and maybe even dolphins playing in the glistening water. On any given summer day, you'll see happy families relaxing in the warm sunshine, skimboarders trying new tricks at the water's edge, couples walking hand-in-hand along the shore, and anglers casting their lines into the sea. Simple pleasures are enjoyed and precious memories are made on the beaches of Nags Head, NC. Before hitting the beach in Nags Head, please carefully review all Beach & Ocean Safety Guidelines from Sun Realty. 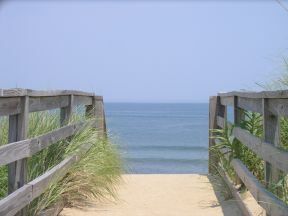 Nags Head, NC offers numerous public beach access, some with bath houses and handicap accessibility. The Town of Nags Heads Ocean Rescue provides both stationary and mobile lifeguard units from 10:00 am - 6:00 pm, Memorial Day through Labor Day. Dogs must be on a leash at all times in Nags Head. Owners must clean up after their dogs. Personal Watercraft must not be operated within 600 ft. of the shoreline or a fishing pier. Beach fires are allowed with a permit, obtainable from the Nags Head Fire Stations at 5314 S. Croatan Hwy. and 8806 S. Old Oregon Inlet Rd. Surfing is prohibited within 300 ft. of any fishing pier. A leash is required to be attached from the board to the surfer's ankle or wrist; the surfer is responsible for controlling his/her board at all times. Stay off of protected sand dunes on Nags Head beaches. Park only in areas permitted by the Town of Nags Head.